Our pick of the best Minecraft servers around. If you need more Minecraft tips and advice, check out our list of cheats and console commands, best Minecraft mods and best seeds for beautiful worlds. 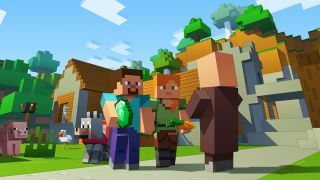 Servers are your gateway to expanding your horizons in Minecraft, and here we've rounded up the best Minecraft servers around. Like fantasy? Want to walk through a blocky recreation of your favourite TV show or film? Want to grief without the fear of a ban? If you answered ‘yes’ to any of the above, servers have got you covered. Joining a server is nice and simple. All you need to do is load up Minecraft as you normally would, hit multiplayer, then add a server. Name it whatever you want, then type or Ctrl+V the IP address into the box below. Save it, click play, and you’re good to go. Just keep in mind some servers need you to download data for them to run correctly. If this at any point fails, just quit out and keep trying. It should work eventually. While this may sound like a Lord of the Rings server, it’s not quite. It’s fantasy, sure, but with a huge focus on roleplaying. The world, and its lore, is already set up, and a helpful warp command means travelling between the different kingdoms (high elves, dark elves, dwarves, etc) is simple. All you need is a killer skin and an elaborate backstory and you’re good to go. You can probably guess from the title which popular video game series this server is based on. You guessed it, the unstoppable juggernaut that is Hello Kitty Online. Or GTA. It’s one of the two. Join this server and you’ll be treated to two different game modes (Grand Theft Minecart and Vice Minecart), as well as 35 different GTA-inspired weapons. There are also plenty of vehicle offerings including cars, planes, and of course, tanks. Because it’s not GTA if there isn’t an option to go on an explodey murder-spree. What’s the one thing missing from Minecraft? Guns! Although that’d just make it Fortnite, wouldn’t it? Either way, if you’re a fan of The Walking Dead TV show or comic, this is a great opportunity to take in all the famous sights as you’re scrambling to find weapons, ammo, and generally anything to help fend off the undead. And because of the voxel stylings of Minecraft, there’s a faint whiff of Goldeneye 64 to the whole thing. Fancy donning a cape while shouting “You have failed this city!”? Maybe you’re an anarchist looking to watch the world burn? Whichever side you choose to join, the Arkham Network has a comic-book world that’s just begging to be explored. And griefed, obviously. There are also a host of different day jobs for making coin, and a wealth of gamemodes to participate in. One of the key rules of this server is make friends, fast. You’ll need them. Arguably one of the best Pokémon/Minecraft mashups out there, Pokefind starts as you’d expect. You meet a professor before being tasked with choosing a Pokémon. The starter choice options mirrors that of Generation 1, so that’s Charmander, Bulbasaur, and Squirtle. Once you’ve picked Bulbasaur (because you absolutely should! ), you can either chill at the Pokémon centre, learn about crafting, or head into the wild and fight some poor animals. It’s just like the actual games, then. A team was always going to attempt to recreate the Lord of the Rings universe in Minecraft, and the result is something truly breathtaking. Everything in this world has been meticulously crafted to feel as real as possible. Taking a stroll through the Shire is a lovely way to lose a few hours, but if you’re not here for a sightseeing tour, there’s also a PvP server. Because of course there is. If you’re new to the world of Minecraft servers, you’ll be forgiven for not knowing what a prison server is. Basically, the player spawns and is locked in an area. In The Tomb’s case, it’s an underground mine teeming with lavish decorations. The goal here is to level up and escape by collecting and selling resources. Think No Man’s Sky if No Man’s Sky was trapped underground without a spaceship. If you’re a fan of relaxing grinding, this one’s for you. We couldn’t put out a list of Minecraft servers without mentioning one of the most popular out there. Extreme Craft keeps popping up because of the sheer amount of modes there are to play, including the likes of a fully fleshed out survival mode, hunger games, factions, skygrid, skywars, skyblock, acid island, and eggwars. That’s on top of a creative mode and the option of roleplaying. It’s like a Minecraft greatest hits compilation. For people who hate people there’s Minewind, an anarchy server where the only rule is don’t cheat. See someone building a nice tower they’ve spent hours on? Tear the whole thing down and laugh as they furiously scramble to get away. Another player near diamonds? Push them headfirst into lava. Here you can grief as much as you desire with zero repercussions. While this is one server you may want to avoid, it’s also a server you may want to visit, because you’re a horrible, horrible person. When you first enter Potter World, you’re greeted by the boy himself battling a dementor as Hogwarts sits ominously in the background. Much like Middle Earth, Potter World goes all out when it comes to authenticity. Buildings appear as they do in the mind’s eye, complete with inside furnishings. You can learn about potion making, duel other wizards and witches, or go off and play a friendly round of quidditch. This is Minecraft at its strongest: creating game worlds that best those of their AAA counterparts.